The Northeast River Forecast Center produces river basin averaged Quantitative Precipitation Forecasts (QPF) for New England and much of New York State. QPF forecasts are routinely issued three times daily around 00Z, 12Z and 18Z. They may also be issued around 06Z during times of increased flood potential. The forecasts are normally produced for 48 hours in 6-hour intervals, but may be extended out to 72 hours during significant rainfall events or times of increased flood potential. 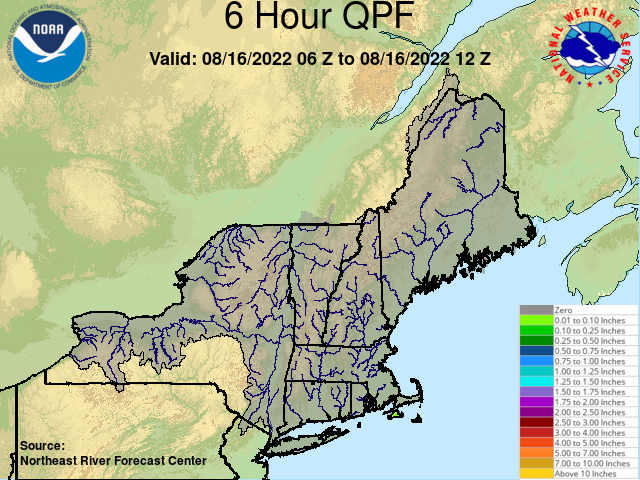 The QPF forecasts are used as input to the NWS Hydrologic River Models.